Shown: Earth tone brown center seam, mahogany and saddle tan lace boots, black ring boot. 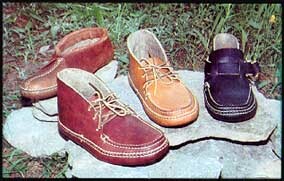 COLORS – Our standard color for moccasins made of our World Famous Leather is earth tone brown. Tan, Black and Mahogany are available, for an additional charge, on a special order basis. Our standard color for Buffalo moccasins is gold. Buffalo moccasins are available in a variety of colors on a special order basis. We have the buffalo dyed at the tannery and are able to offer colors at no additional charge. All linings are of elk; Collars will be a coordinating color. Color examples, below, are provided to give us a common reference for color discussions. 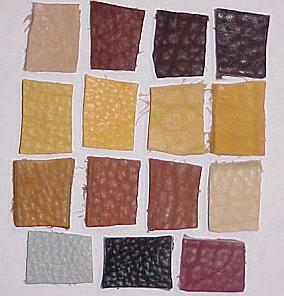 Leather is a natural material and there will be color variations between individual hides. (top-brown family, 2nd-gold family, 3rd-tan and smoke, 4th-gray, black, and mahogany.